For our Halloween party this year we’re making white chocolate ghosts.The’re a delicious treat. Here’s the recipe. Put wax paper on a baking tray. Break the chocolate into small pieces.Put the pieces ina bowl. Melt the chocolate in the microwave and syir it.be careful! Put the chocolate in a small plastic bag. Close the bag and cut off the corner. 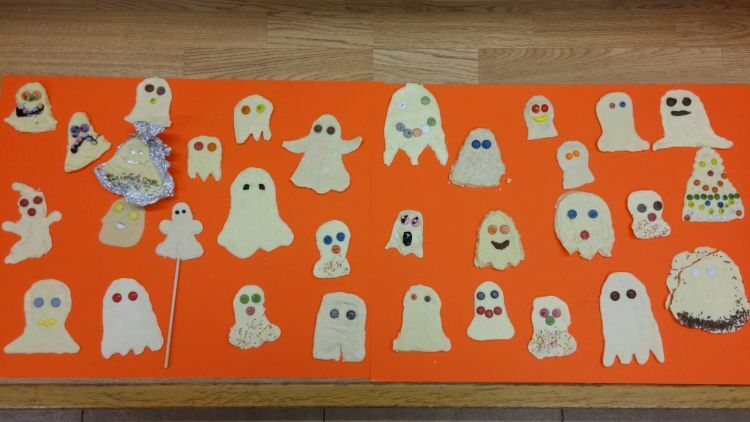 Pipe the chocolate into ghosts shapes on the wax paper. Add twoo sweets to each ghosts for the eyes. Wait until the chocolate is hard.Take the ghosts off the paper and eat them! Click here to see our ghosts.